Owning a business is not for the faint of heart. It requires a lot of time, commitment, and hard work. There are a lot of factors that make up a successful business, such as outstanding service from staff members, maintaining competitive pricing, exceptional advertising, and a good reputation. When it comes to a good business reputation, the cleanliness of an establishment plays an important role. And, one way for a business’s positive reputation to become compromised is the invasion of pests. Pests pose a unique risk for businesses of all types, such as retail, restaurants, and hospitality. One pest in the wrong place at the wrong time can risk damage to a business’s product line as well as their reputation and revenue. In order to protect your business from product contamination and property damage, and to protect its reputation, keeping bothersome pests out is crucial. There are plenty of pests that can enter a business and cause a stir of problems. A rodent infestation can create unsanitary conditions, especially in the food industry, when food sources are contaminated with salmonella. Through saliva, urine, and feces, rodents can spread more than 30 hazardous pathogens. Plus, rodents can cause significant property damage to a business’s structure. Rats, mice, and other rodents will chew furniture, structures, and products and items, potentially leaving business owners with costly repair bills. Birds are other pests that can be a nuisance for many businesses. While birds may seem like an unharmful and an unlikely pest to damage a business, bird droppings and cause terrible odor and unsightly messes on the roof and walkways and steer potential customers away. For industrial businesses, birds are known to fly into machinery. This usually results in a mess and potential damages to the machinery and the products. There are a variety of other pests that can intrude your business to be on the lookout for, such as flies, ants, termites, moths, and many more. However, any pest that leaves behind feces, dead carcasses, shed wings or shells can scare away potential customers and damage or contaminate certain areas or products. If a business has a pest infestation, there is a good chance that these pests will make their way to certain products and items, or into areas where they will be noticed by customers, hurting its reputation. In order to protect your business from damage caused by pests, it is important to take the necessary measures to ensure they are kept away. 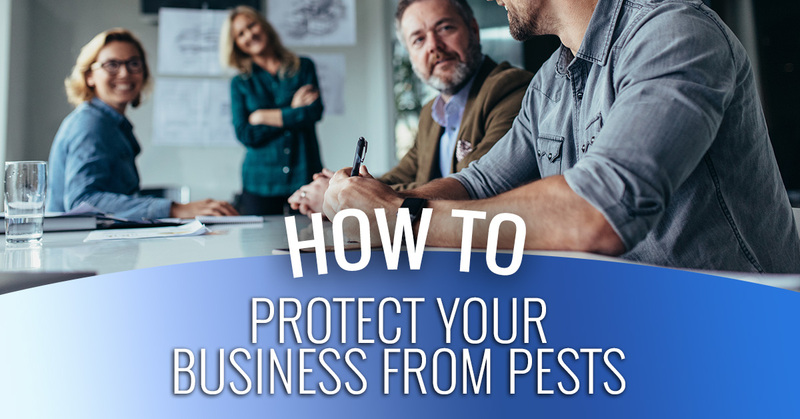 To help, we put together some helpful tips that will help businesses stay protected from bothersome pests. Insects and other pests are drawn to a messy environment, so in order to prevent an infestation, it is important to ensure that the messes outside of the property are cleaned up. Be sure to keep piles of leaves, grass clippings, and other waste away from the property, especially in areas where pets could easily get access inside, such as near doors, windows, and other openings. Keeping the areas outside of a business clean and tidy will reduce the number of places that pests can live, therefore decreasing the chances of an infestation. The easiest places for pests to enter a commercial building is through the cracks, crevices, and broken seals in the doors and windows of the building. In order to keep pests out, all the seals on the windows and doors should have a close, tight fit. If any seals appear to be broken or drafty, or you notice any cracks, holes, or openings nearby, be sure to make the necessary repairs. It may be helpful to hire commercial pest control services to inspect for areas throughout your business where pests could easily get inside and start causing problems. Depending on what type of business you own, if you want to keep bugs and pests out the best way to do so is by cleaning things up that could draw them in. From food, garbage, and moisture there are plenty of factors that will attract pests inside your establishment. If your business has a break room or you run a company that deals with food items, clean up dirty dishes, keep food tightly sealed, be sure to take out the garbage, and avoid moisture and other things that could breed mold or mildew. Whether you are trying to prevent or get rid of rodents, ants, termites, pantry pests, or any other pests, remind yourself of the basic survival needs of living creatures: food, water, and shelter. Keeping the inside of your business tidy will help eliminate sources that attract these burdensome pests. Even business owners who take the precautionary steps to keep pests away, they can still find ways into a commercial building. When small problems go unnoticed they can quickly turn into a potential pest infestation. The best way to keep pests out of your business is to contact a local pest control company. A professional exterminator will not only be able to eliminate existing pests, they can help prevent an infestation from occurring in the first place. Need Pest Control in Eau Claire? As you can see, pests pose a threat to businesses. The best way to keep pests from invading your business is to contact a professional pest control company. When it comes to pest control in Eau Claire, Menomonie, Mondovi, and the surrounding areas, you can rely on 1st Choice Pest Solutions. Contact us today to get started.